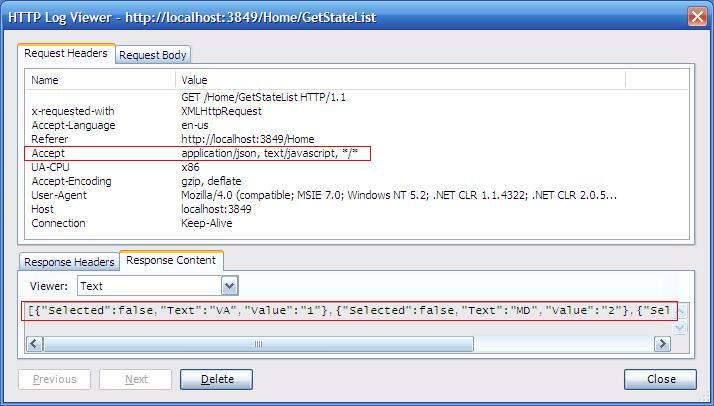 The latest release of the MVC framework provides the JsonResult for Controller actions. I was surprised that I did not find a weatlh of examples for usage so I figured it shouldn't be too hard to get a decent example going. It turns out, it was even easier than I anticipated. I wanted to create an example where I would invoke an AJAX call to dynamically populate a dropdown list. Notice the "application/json" in the request header and the textual representation of the JSON that is being returned from my JSON controller action. On line #13 above you'll see the strongly-typed "Text" and "Value" properties that I have the luxury of using because of the native JSON serialization into objects. The complete code sample can be downloaded here. It's barely 50 lines of code in all.